We have to wonder – if not smirk – at a recurring pattern that has come to define Cambodian politics. From 1993 to 2013, that pattern has consisted of a few common denominators: political bickering that leads to an impasse ignited by the opposition, further leading to power sharing arrangements (coalitions), all of which are often sparked by allegations of voting irregularities and fraud. Those facts have become quite mundane. What is more interesting is the idea that the ruling party now recognizes its waning power and appears to be interested in reforming because of it. Whether or not the call for real change – for the masses – is authentic is a different story. But before we talk about change, let’s take a trip down memory lane. See if you can pick a pattern. For starters, it’s hard to forget the 1993 elections – arguably one of the biggest flops in democratic history. Hun Sen of the Cambodian People's Party and Funcinpec’s Prince Norodom Ranariddh signed a power sharing agreement that created a co-premiership. That arrangement didn’t bode so well for Ranariddh, or his royalist Funcinpec party, whose popularity has waned significantly over the years, to the point where it was unable to win any seats in the recent elections. And then, in 1998, there was a political deadlock that lasted over four months, despite the bloody July 1997 coup d’état forcing Ranariddh into exile. In 2003, another deadlock dragged on for nearly a year between the ruling CPP and the “Alliance of Democrats” – a coalition formed in August of the same year between Funcinpec and the opposition Sam Rainsy Party. That coalition also didn’t last very long, despite the idea to merge eventually into one political party. Unfortunately, in 2006, Ranariddh had an internal spat with Funcinpec and later spun out to form a different party: the Norodom Ranariddh Party. In 2008, the CPP ended up winning 90 of the 123 National Assembly seats, leaving them with an absolute majority. On some level, this year’s elections have been more of the same. Another political impasse has kicked into full gear, with the opposition Cambodian National Rescue Party (CNRP) officially boycotting the first National Assembly meeting. According to the Constitution, 120 elected members of parliament are required to attend that meeting. The CPP, however, contends that is not the case and, in fact, has threatened to redistribute CNRP seats to CPP officials. Demanding more time to negotiate with the CPP, the opposition sent an official letter to King Norodom Sihamoni to postpone the first legislative meeting until November, or 60 days after the country’s electoral body announced the official results. Despite the letter, the King, who is mandated by the Constitution to preside over the first meeting, showed up for the National Assembly on September 23, which was only attended by the ruling CPP. The CNRP, on the other hand, was in Siem Reap rallying at Angkor Wat, as they continued to press for an independent investigation of election results. Obviously, this has left many people – supporting both parties – quite upset. There’s no telling how long this year’s political stalemate will last. Still, we shouldn’t overlook the modest reforms that have taken shape. Perhaps for the first time in Cambodia’s post-UNTAC history, the ruling CPP is acting on the fact that a good number of Cambodians are unhappy with the status quo. And, ipso facto, the party recognizes that it needs to change. What’s new, however, isn’t the acknowledgement of public unhappiness, but rather the need to reform in response. For example, we’re seeing the CPP and its leader Hun Sen reshuffle the government, plugging in new blood – albeit sons of the elite – while repositioning old leaders into different posts, in addition to raising wages for civil servants and local government officials. The people’s voices have been the real catalyst for change here. Though exciting, it is worth cautioning against premature celebration. The country still has a ways to go, particularly in terms of embracing widely accepted attributes of democracy, at least the Western notions of it. The country has competitive elections, but they need to be free and fair. And while the presence of the opposition party is a good first step, the government must continue to push for a stronger legislative, judicial and electoral body while always remaining accountable to the people. Still, there are other concerns. What should have been peaceful demonstrations led to the death of Mao Sok Chan, a bystander who was shot in the head, as clashes broke out between civilians and security forces on the first of three days of opposition protests. Prince Sisowath Thomico, a leading royal figure and CNRP supporter, was removed from Wat Phnom during a hunger strike in protest against recent election results, which he claims were marred by irregularities. Other peaceful protests just days leading up to the first National Assembly meeting had been broken up by security forces, and a few people have sustained injuries. But it’s not all bad news, all the time. This year we’ve seen fewer politically-motivated deaths, threats and intimidations, at least compared with previous election cycles. For reasons still unknown, Hun Sen has been less abrasive in his comments and speeches regarding the opposition. And while the CPP maintains its claim to victory, it’s open to concessions with the opposition – indicating that the ruling party is interested in moving forward. Though small, these changes shouldn’t go unnoticed, especially for a country anchored by decades of political conflict and violence. Sooner rather than later, the ruling CPP should negotiate with the CNRP in its plea to share power. Yale University’s David Cameron reminds us that Cambodia isn’t a unique case, and slow forming democracies aren’t an Asia-specific problem. Challenges continue to arise in post-communist Europe and Eurasia, for example. He argues that countries with close ties to the European Union, either current or aspiring members, have consolidated or are in the process of consolidating democracy. Conversely, other European and Eurasian countries are backsliding into some variant of authoritarianism, using Russia as one prime example. So, given where the country has gone, in relation to where it’s been, it’s important to remember that democracy building in Cambodia, like anywhere else, takes time. There are no overnight successes. 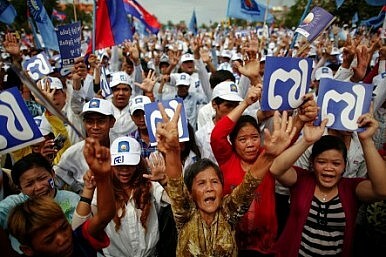 It’s too soon to say whether reform in Cambodia has teeth. But as the country braces for another stalemate, people should be reminded of how much progress the country has made over the years. And, more importantly, leaders must remember that the people are demanding change, now, with some putting their lives on the line. That demand for change, we can say, is authentic. Peter Tan Keo is an independent analyst and founder of Global Strategy Asia. He was educated at Harvard University and The University of Chicago, and is completing a doctorate from Columbia University. Follow his blog at usaseanforum.blogspot.com. For questions or comments, please reach him at [email protected]. It is not clear what good the opposition figure’s reentry would do for him, his party, or his country.